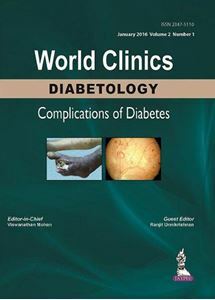 This book is on “World Clinics: Diabetology”. Diabetes mellitus has become a global problem worldwide. It is estimated that there are 387 million people with diabetes worldwide, 67 million of them in India. Type 2 diabetes mellitus constitutes 95% of all types of diabetes seen in most parts of the world while other types of type 1 diabetes mellitus, gestational diabetes, and secondary form of diabetes are less common. The acute and chronic complications of diabetes account for most of the morbidity and mortality associated with the disease. The book “World Clinics Diabetology” is readable and complete enough to meet the students’ needs. The information given in the book is elaborative yet it is concise and to the point. The book deals in detail about diabetes mellitus in 14 brilliantly carved chapters. The variety of topics covered in this issue ranges from microvascular complications, such as nephropathy, retinopathy, and neuropathy to macrovascular disease and acute metabolic complications, such as diabetic ketoacidosis and hypoglycemia. The book “World Clinics Diabetology” would be a valuable addition to any library and would be useful not only to practicing physicians and diabetologists but also to postgraduate students.